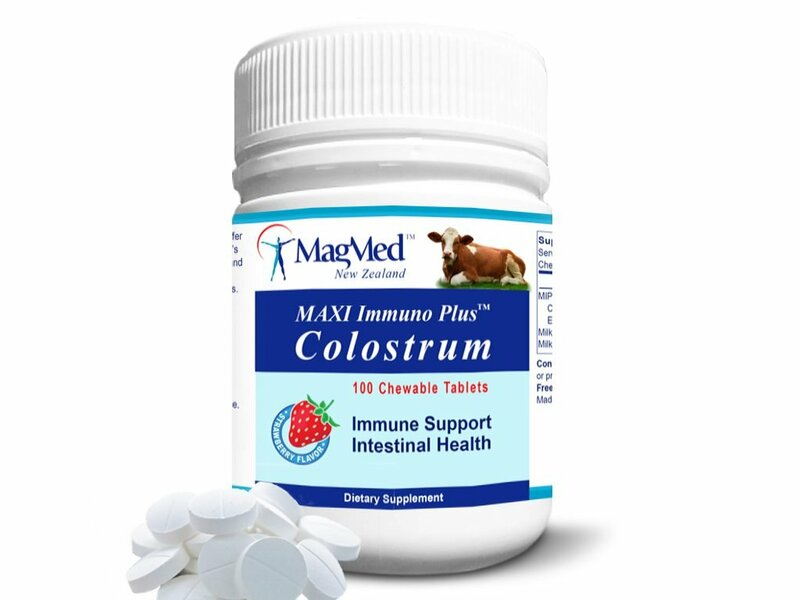 Maxi Immuno Plus™ Colostrum Chewables are a deliciously easy way to provide the goodness of nature’s first superfood. Suitable for both, adults and children age 5+. Containing 100% pure natural bovine colostrum which is an incredible source of Proteins, Immunoglobulins, Growth Factors, Nutrients and Minerals. It helps strengthen the immune system, fights viruses, bacteria and parasites, helps with better digestion, bowel function, tissue building and faster recovery in fitness and sport. 100 chewables per bottle. 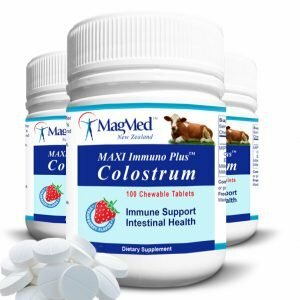 Each tablet contains 550 mg of pure and undiluted MIP Colostrum Powder, 240mg milk powder and 85 mg milk calcium powder – light Strawberry flavour. NO ADDED wheat, gluten, corn, yeast, artificial flavours, colours or preservatives. It is free of rBST (hormones) and free of GMO (genetically modified organisms). 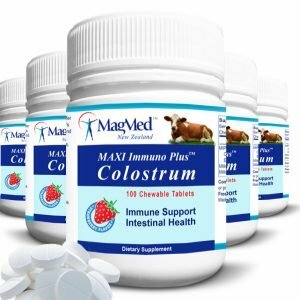 MIP Colostrum is 100% pure and undiluted Colostrum sourced from certified healthy, pasture-fed New Zealand cows that are free from pesticides, antibiotics and synthetic hormones. It is an incredible natural source of Proteins, Immunoglobulins, Growth Factors, Nutrients, Vitamins, Minerals. Enhanced by an energising process to ensure biological activity. Use the currency converter at right to show your currency. Your order will be processed in NZ Dollars. Directions: take 1-3 Chewables daily – suitable for both, adults and children age 5+. After Sport: take an additional chewable tablet right after exercise or training to enhance recovery.